My hand became a shield against the sun. A black shadow appeared, growing larger and larger as each minute passed. The shape drew closer, a spreading swarm across the horizon. I'd have sworn I could hear the drumming of the horses hooves. It was only the sound of my heart pounding as the shadow became more distinct. "There" Edmund pointed. "I can see them" My heartbeat became a gallop. Again tears started. I brushed them away from my cheek before he could see them. "I've let the enemy inside my gates." "I am inside your gates." A strange twist on Lord Leofric's lips. "And inside them I intend to stay. But enemies..that's not my intention." I'm sure most of you have heard of Lady Godiva, just as I have. She went down in history because she rode naked on her horse through her town. If you are like me, you don't know why she rode naked or any of the events leading up to her naked ride. This is back story told eloquently and beautifully by Eliza Redgold. You'll be hooked within the first chapter as this author captures the time period, the historical characters and how they would have acted, as well as providing a concise detail of all the things that happened before Lady Godiva took that famous ride. Godiva, a Saxon, lived during England's Danish time period. Despite the fact that the king was viewed as a more apt ruler than his Saxon predecessor, the Danes are very much the antagonists in this story. Lord Leofric, the Earl of Mercia is rebuilding his Saxon lands after they have been destroyed by the Danish warrior Thurkill the Tall, while also attempted to prevent the same thing from happening to his neighbors in the Middle Lands, including Godiva's Coventry. Godiva realizes the best way to defend her newly inherited lands from the invading Danes after her parents have been murdered by Thurkill, is to hurt her childhood best friend Edmund, who had hoped to marry her, and instead marry the powerful Earl of Mercia, a man she barely knows. Godiva is frightened of Lord Leofric, but she also knows he is the one and only man that can save all that her parents left her with, the land of Coventry. Lady Godiva is impulsive, strong willed and perfectly capable of taking care of herself. Her father taught her how to fight with swords so she is not your typical female that was around in those times. She was brave and wanted to go her own way. There was just one problem, Lord Leofric wouldn't allow it. Lord Leofric comes off as controlling and selfish. He is trying to save his lands of Mercia from the Danes. He has lost a lot already and still has a lot to lose. He is quiet, and reserved and acts like he won't take less than full control of Coventry and Mercia. The novel had a steady and eventful plot. In a mystery style, there are clues hinted to through out the story that kept the reader wanting to know more and wanting to read more. All in all, an enjoyable, and well thought out novel. 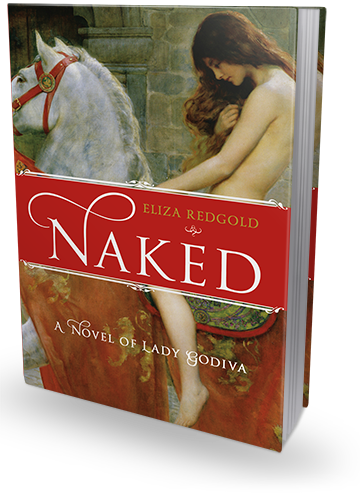 To enter to win a copy of Naked: A Novel of Lady Godiva or a $50 Amazon Gift Card, please enter via the GLEAM form below. Rules – Giveaway ends at 11:59pm EST on August 28th. You must be 18 or older to enter.